#32 Pikes Peak – 14,115′ – Full Moon Climb April 20-21. Visit the Live Progress tab for updates and more details including photos about each descent. #1 Monday January 4 — Mt. Elbert 14,440’ SE Ridge HERE WE GO! Start 10am, Summit 2pm , Half Hour on the Summit, Finish 330pm. 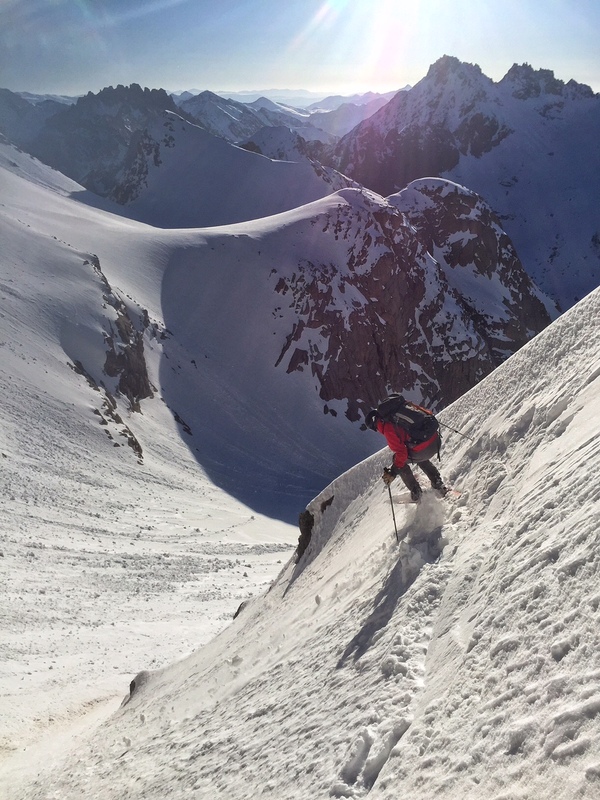 Ski Descent: South/ SE Couloir, down in 1 hour from the summit. Start 630am, Summit 11pm , Half Hour on the Summit, Finish 130pm. 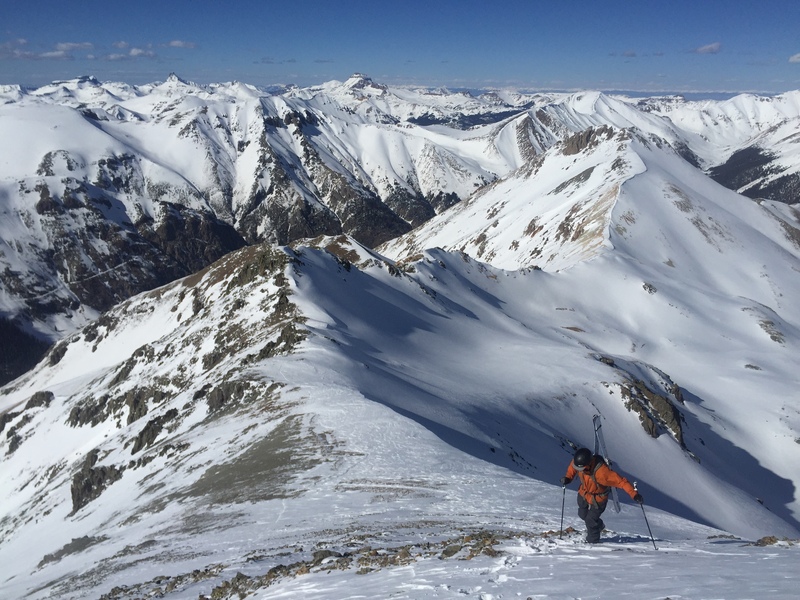 Ski Descent: E Ridge, SE Slopes down in 1:30 from the summit. w Udall, Migl, and Tomer. 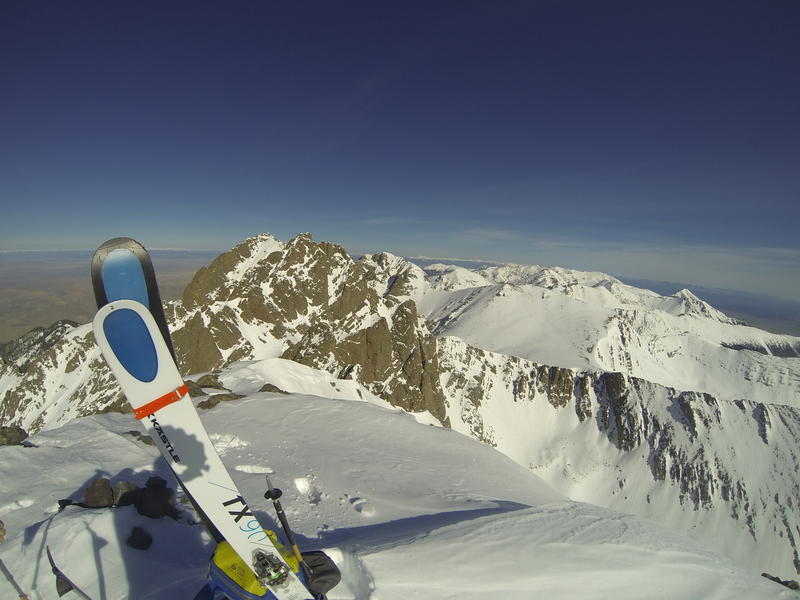 Migl and I summited at 2pm, Great weather window and we filmed a Tomer’s trails episode: Skiing Mt. Harvard for Tomer’s Trails, KWGN 2 Denver. Start 630am, summit 2pm, finish 6pm. 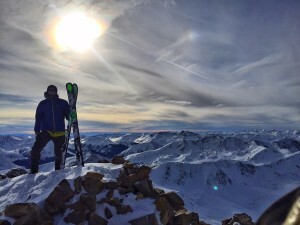 Quick easy summit with Tomer. Start 6am, summit 9am, finish 11am. Nice and Windy but we got it done! My brother Jared Pulled me to Summer trailhead on snowmobile. Then I soloed from 9am-2pm up unconsolidated powder and 1ft of depth hoar with 2 ft of powder. Summit 2pm, then skied down and made it 9 miles past Winfield to car on road back to car by 5pm. Long day! 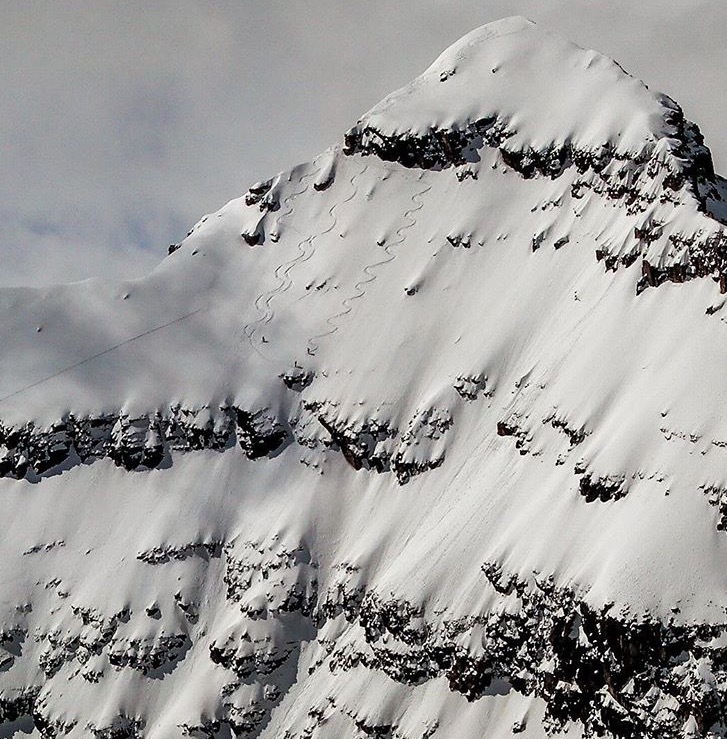 Twofer with Wetterhorn….broke trail all day solo. Start 230am, summit 9am 30 mins on summit. 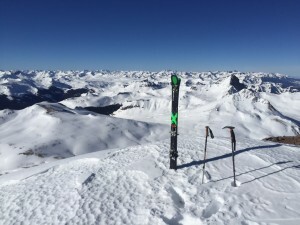 Skied West face, made it to the pass at 1030am, then headed to Wetterhorn. Lunch break below the face at 1130am climbed SE ridge to summit by 2pm. Finish 6pm. LONG DAY since local roads were closed and not even snowmobile tracks! Started 530am from the Headquarters. Broke Trail after the Snowmobile track ended above the meadowed ridge….diagonal line through aspens to 4-Way, then broke trail all the way to the large cairn on the ridge. 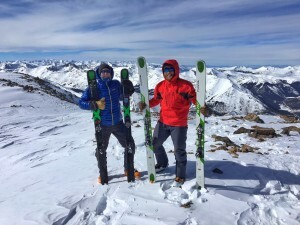 Summit by Noon, 30 mins on top, skied down and met up with two guys (Rob and his friend) It was Rob’s last 14er. 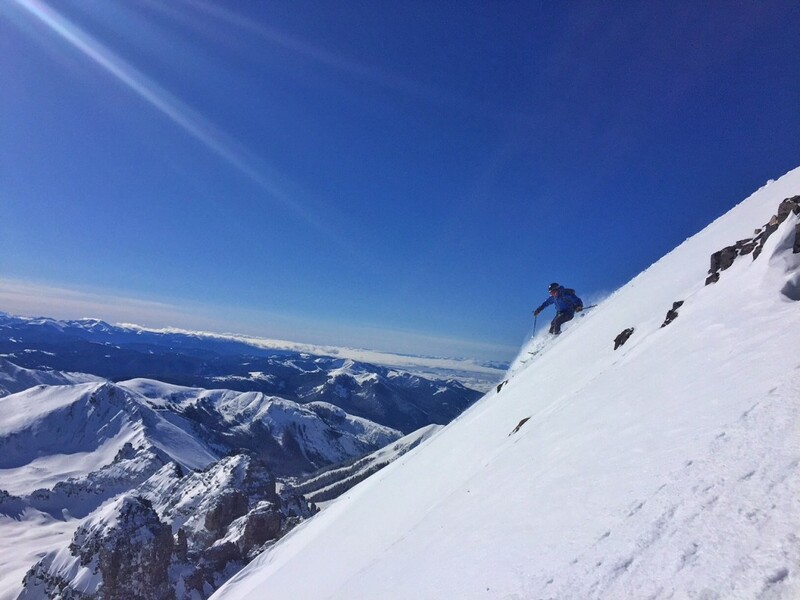 Then I skied back down and was at the headquarters by 245pm. 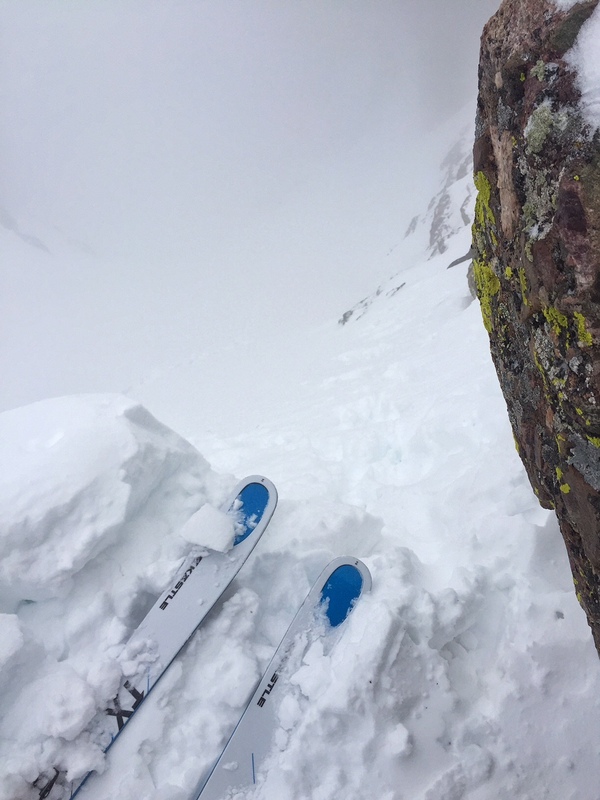 The west face/ NW Face powder was good! Hwy 82 toward Sayres basin to the SW ridge and to the top, descent NW ridge to north Bowl. Start 630am, Summit 1pm, Finish 430pm. Tomer, Udall, Anna Migl, and Scott Benge came along and really motivated me to finish my 4th peak in 4 days since Wednesday of that week! Scouted the Crestones and Kit Carson on this trip. The winds were very strong as I managed to make it to the top of Humboldt around 11am. 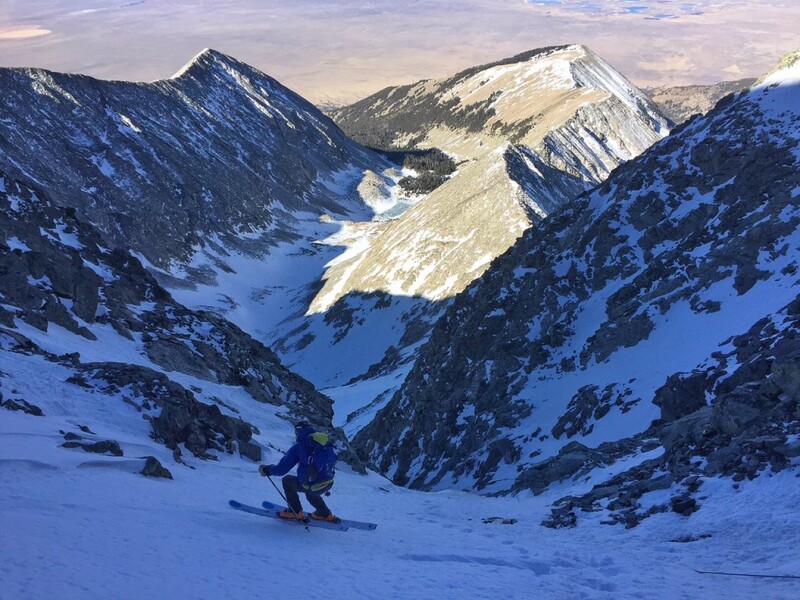 I skied back to my camp in 50 mph winds in South Colony basin, but it felt great to get my 10th peak of the project finished. #11 Friday March 4 – Princeton 14,197’. 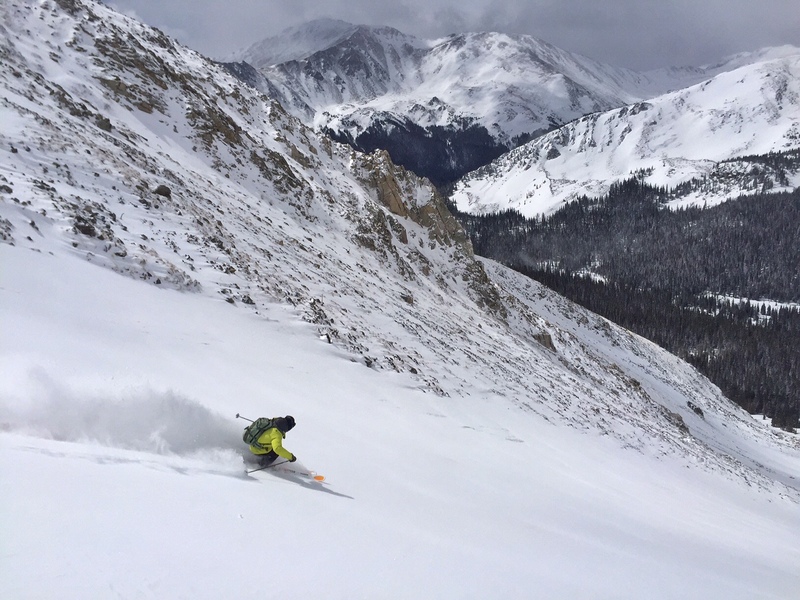 Skied the East/SE face in reasonable coverage. 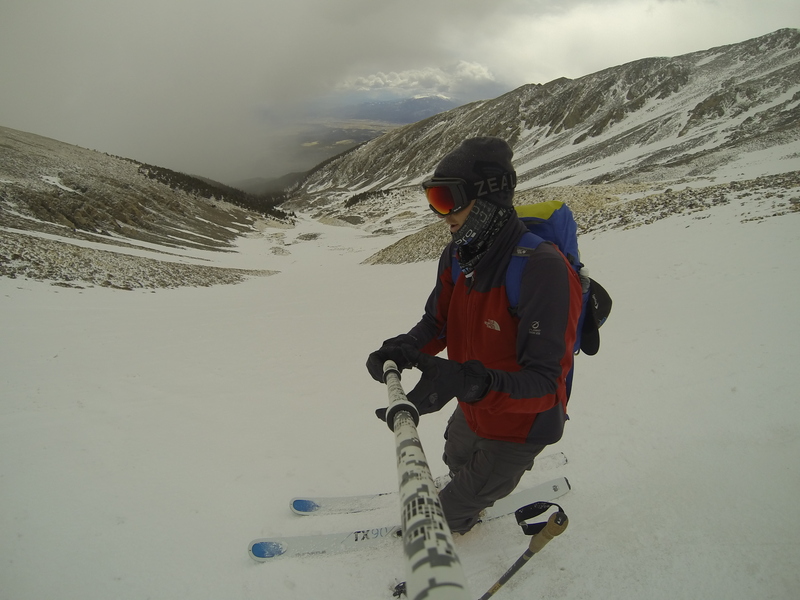 Fun Solo Day in the Sawatch. Saw some goats. 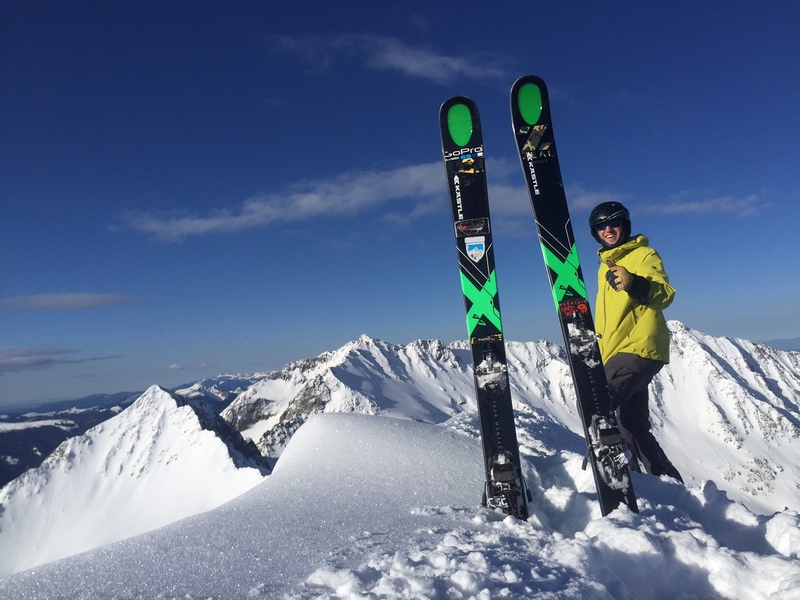 Best summit and ski of the season so far, up to 18″ of powder in places, with a pure ski descent all the way down. 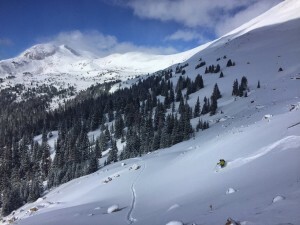 Cold blower powder and calm conditions. Dropping directly off the top of Castle! #13, #14, and #15 Friday March 11th: Missouri (14,067′), Oxford (14,153)’, and Belford (14,197′). 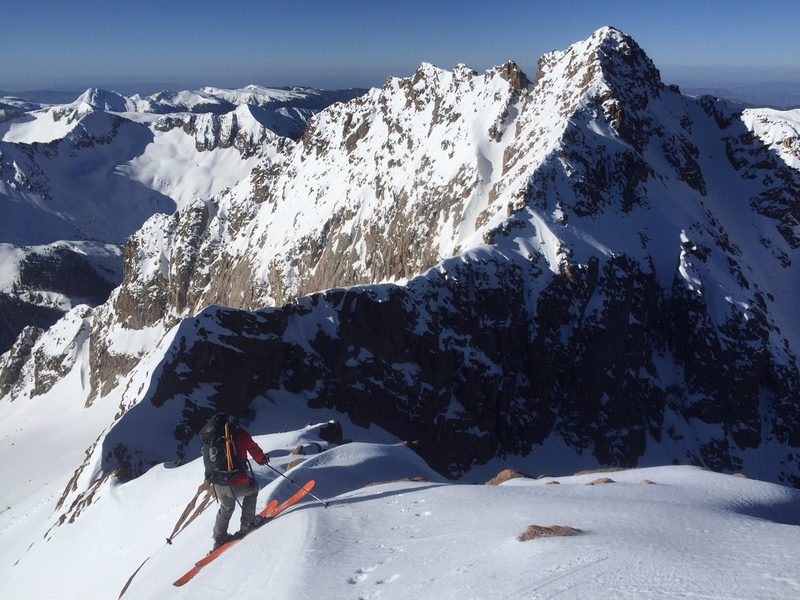 North Face Mizzou to West Ridge Oxford to West Face of Belford. 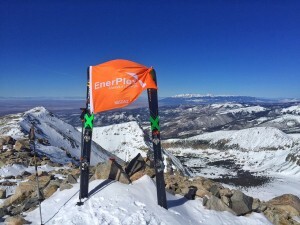 THREE PEAKS SKIED for the Day in Light winds. Making delicate turns in the upper section. Not the greatest conditions. #21 Sunshine, #22 Redcloud, #23 Handies. The Triple Day, Skiing all Three! Sunday April 3. #24 San Luis Peak, April 4. 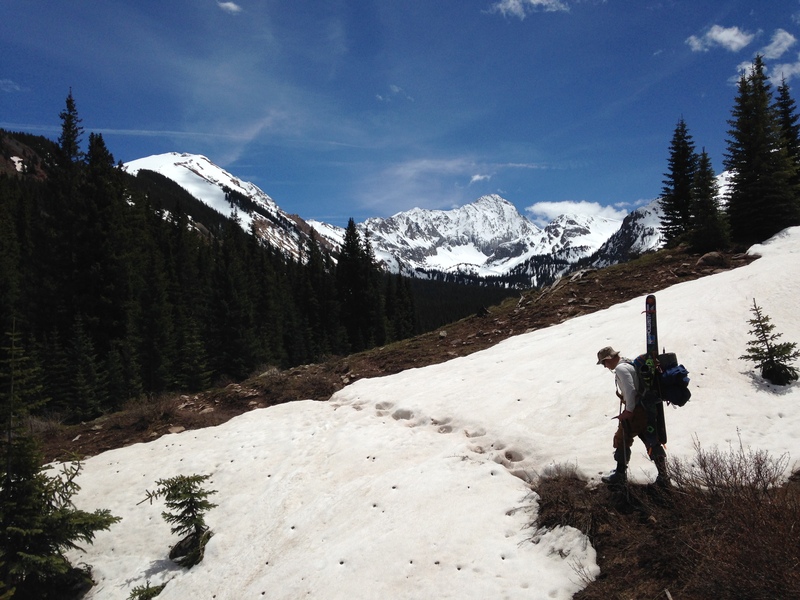 19 Mile Day Solo Mission in the San Juans. Such a gorgeous day on my 4th 14er in 2 days! #25 Bross, #26 Lincoln, #27 Cameron, #28 Democrat, Thursday April 7. 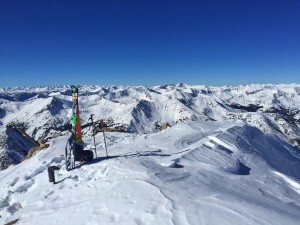 Summit of Democrat 14,148′, Peak #28. 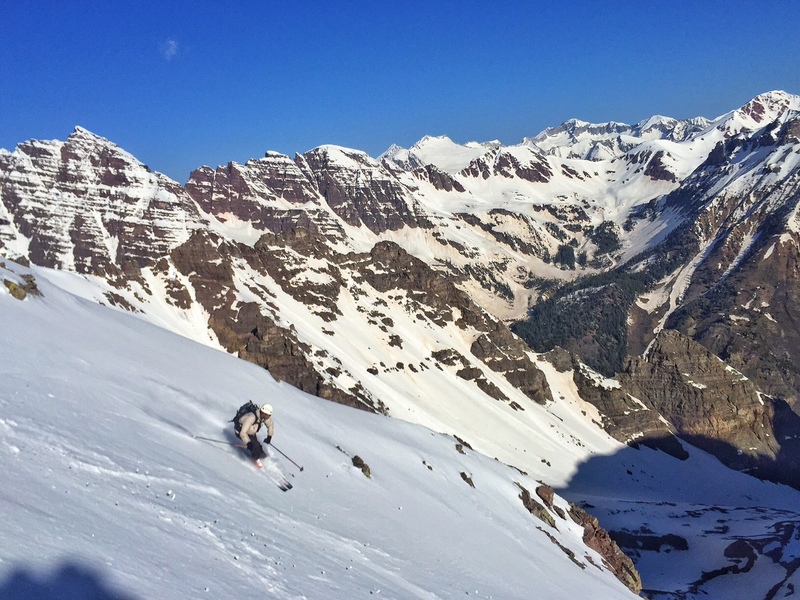 #29 Shavano (14,229′) and #30 Tabeguache (14,155′), Tuesday April 12. 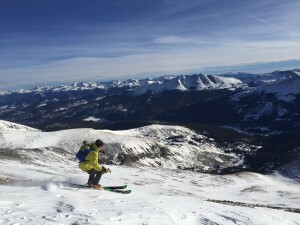 Skiing the Angel of Shavano. #31 Mt. Lindsey (14,042′) Wednesday April 13. 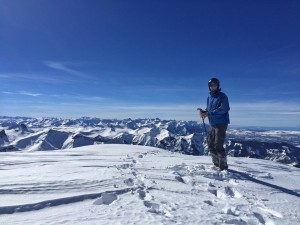 Summit of Lindsey with Blanca and Ellingwood in the distance in fresh powder. 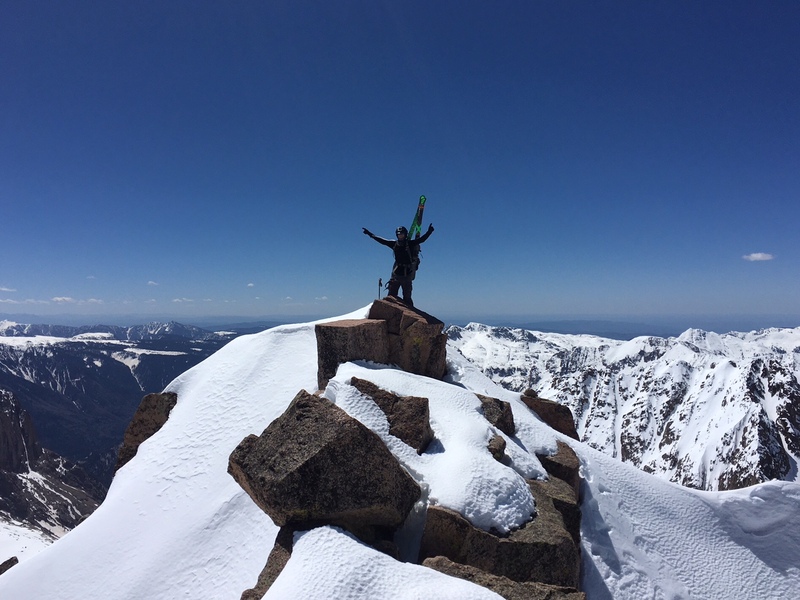 #32 Pikes Peak (14,115′) April 20-21. 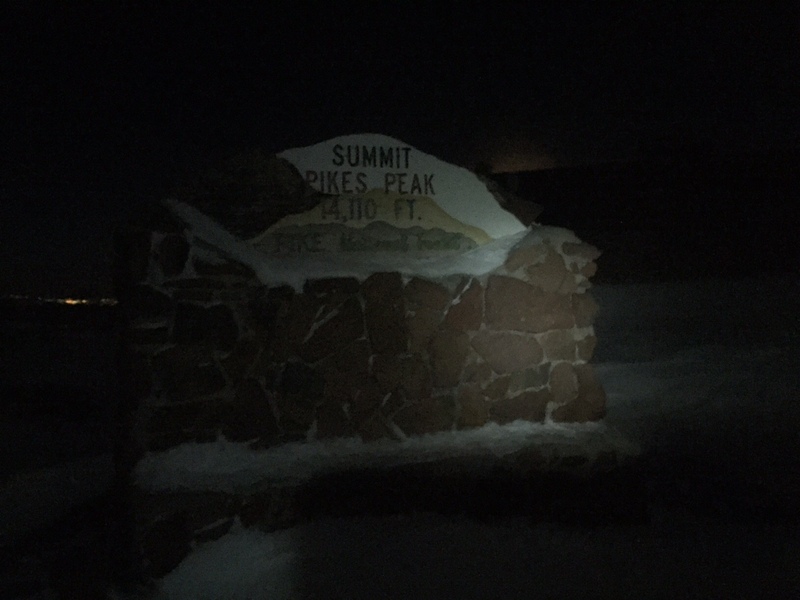 Pikes Peak Summit in the full moon at 1am on April 21. #33 Antero (14,269′) April 21. #34 Holy Cross (14,005′) April 22. Holy Cross Summit 14,005′ Peak #34 of 2016. 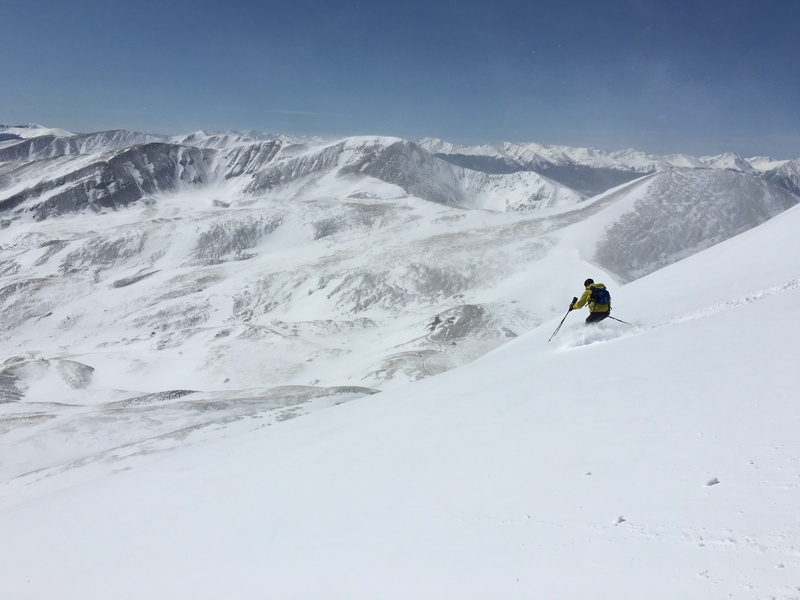 Twofer on #35 Grays (14,270′) and #36 Torreys (14,267′) April 25, 2016. 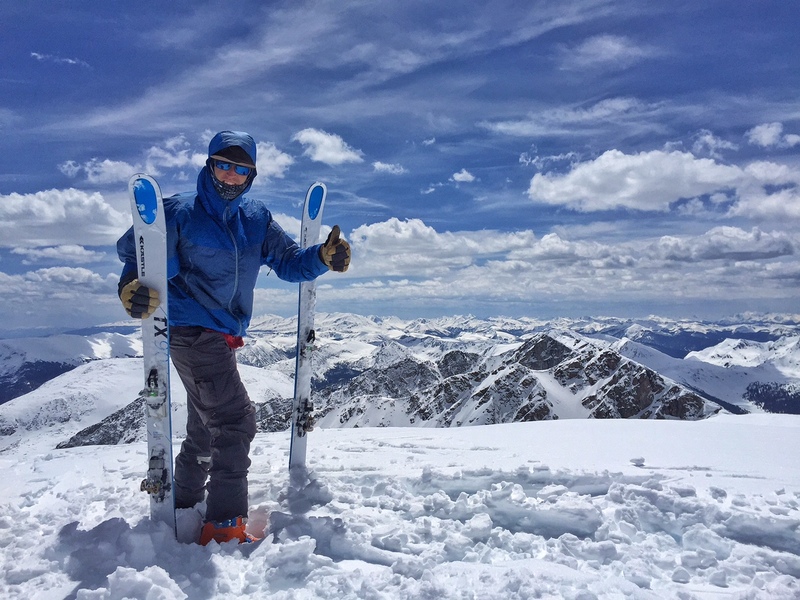 Getting ready to drop into the Dead Dog on Torreys. #37 Mt. Massive 14,420′ Sunday May 1, 2016. 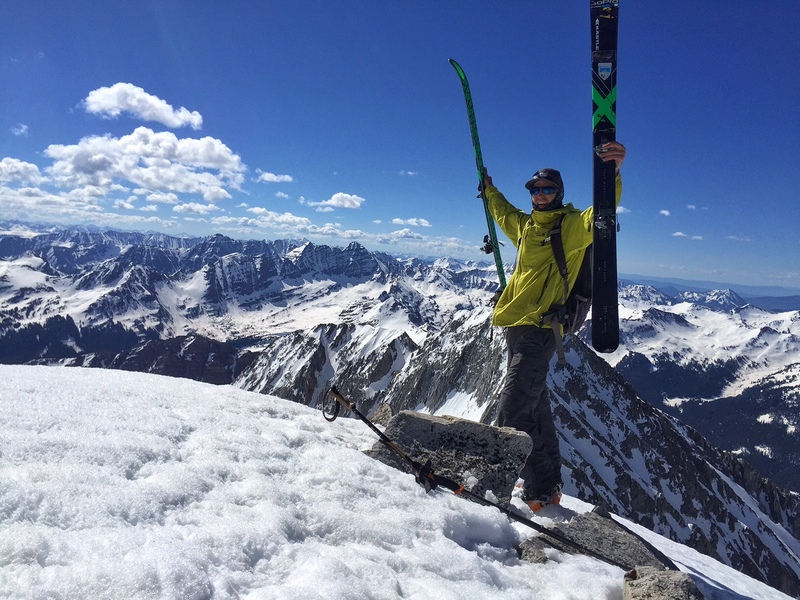 Summit of Massive 14,420′, My 6th official ski of this peak in my career. #38 Evans (14,264′) and #39 Bierstadt (14,060′) Twofer on Tuesday May 3, 2016. 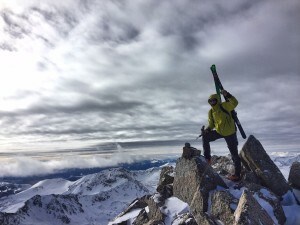 Summit of Evans (14,264′), skied right off the top, Observatory in view. 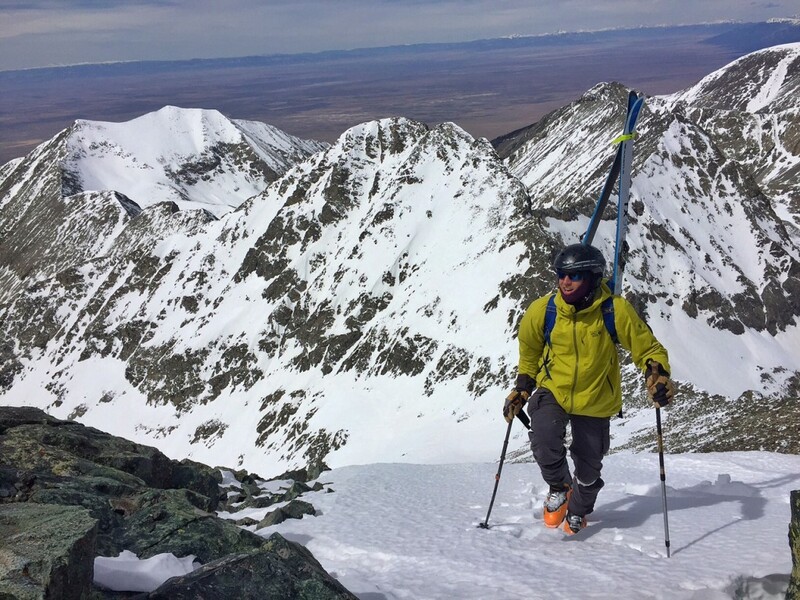 #40 Crestone Needle (14,197′), CINCO DE MAYO SKI, May 5, 2016. 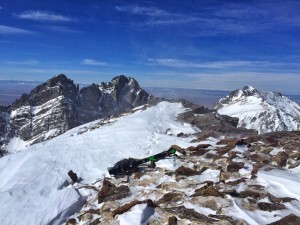 Summit of Crestone Needle – May 5, 2016. 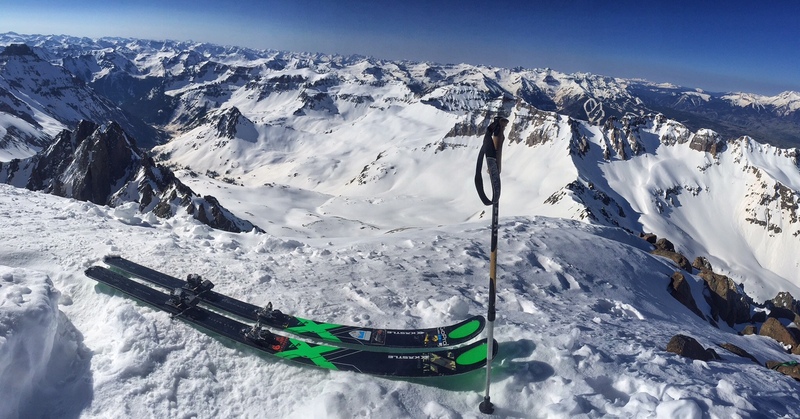 Great view over to Crestone Peak and Kit Carson, all in amazing snow and ski conditions. 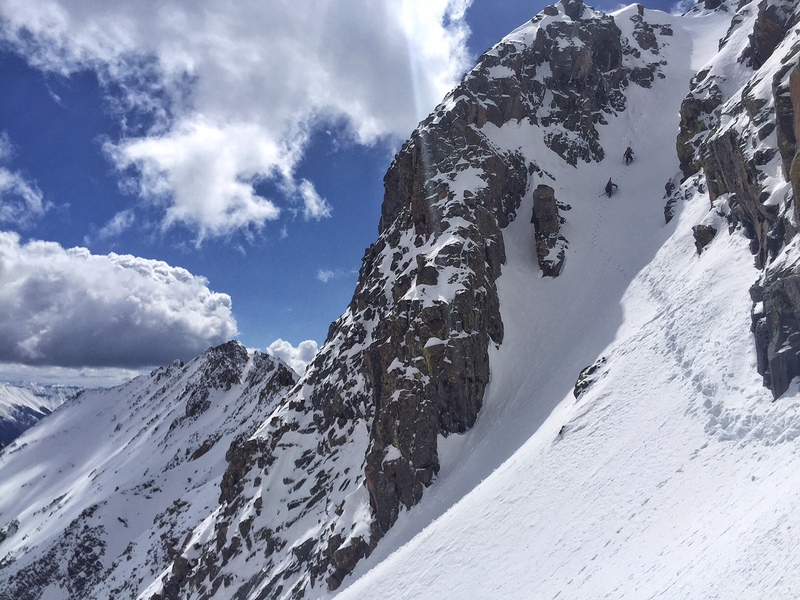 #41 Crestone Peak (14,294′), May 6, 2016. 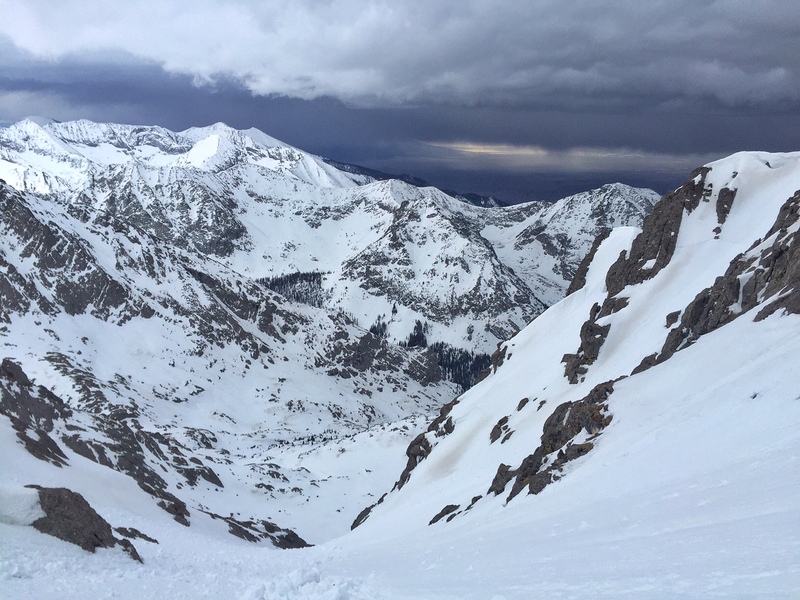 Storm rolling in from the south as I skied down the south “Red” Couloir on Crestone Peak – a delightful line. 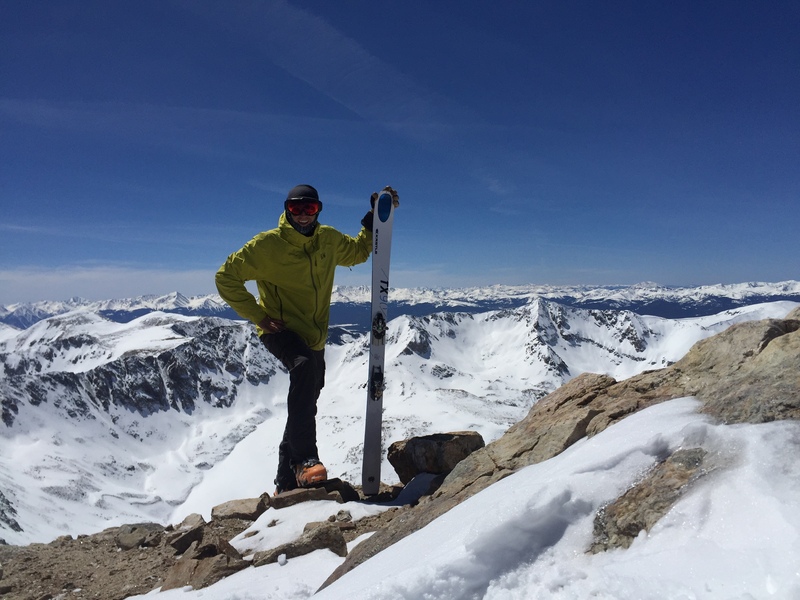 #42 Kit Carson Mountain – 14,165′, Tuesday May 10, 2016. 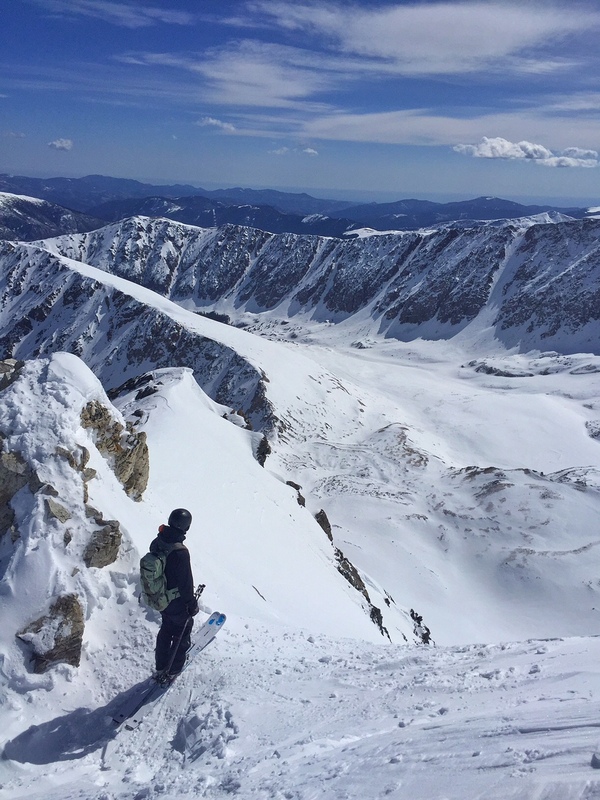 Getting ready to drop into the OB Couloir. #43 North Maroon, 14,014′ Thursday May 19, 2016. The three of us on the top part of the face, Photo by Jordan White. #44 South Maroon (14,156′) Sunday May 22, 2016. #45 Eolus (14,083′) Tuesday May 24, 2016. 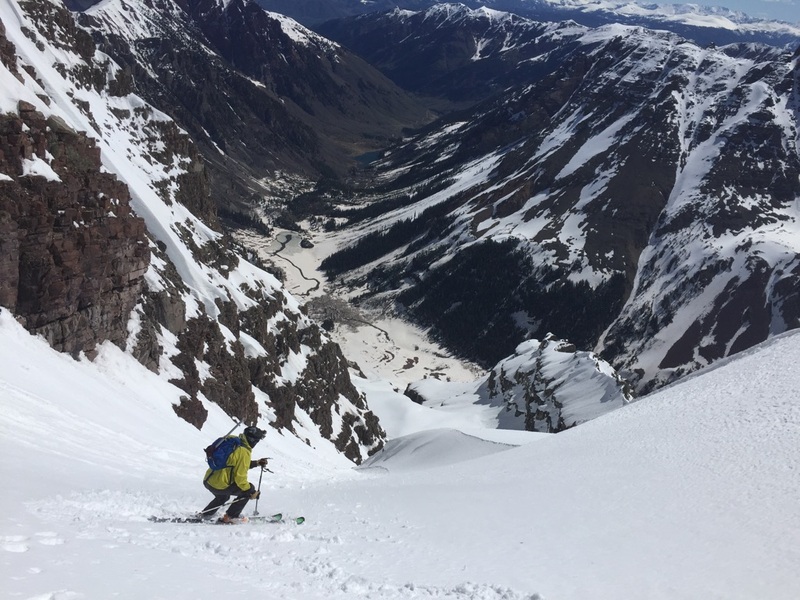 Eric getting after it in the East couloir. #46 N. Eolus (14,039′) Tuesday May 24, 2016. Eric dropping in on North Eolus with Eolus in the Distance. #47 Sunlight (14,053′) Tuesday May 24, 2016. #48 Windom (14,082′) Tuesday May 24, 2016. Me on the summit of Windom (Tara Dactyl Photo). 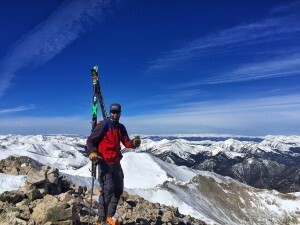 Wilson Peak – Tap the rockies at 14,017′, first peak of the day. #50 El Diente (The Tooth) 14,159′ Sat May 28, 2016. 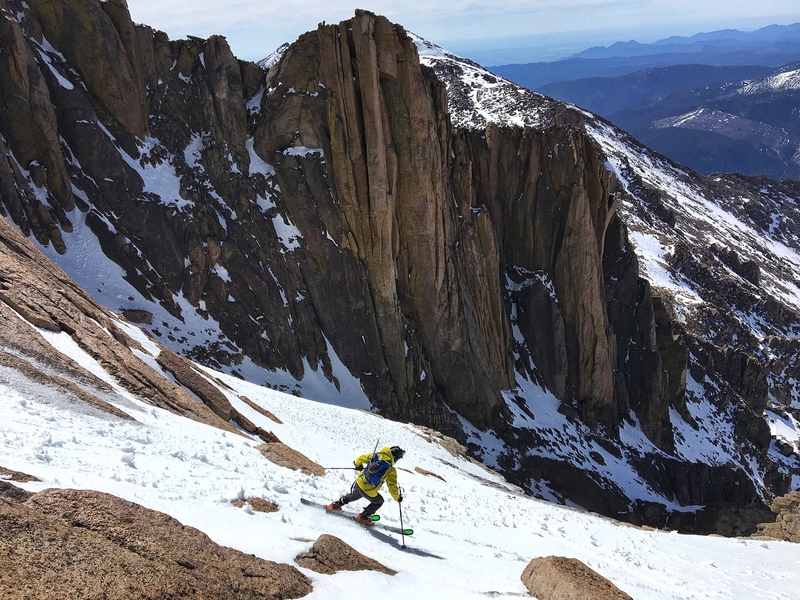 Climbing the Fox Traverse on 14,159′ El Diente. #51 Mount Wilson 14,246′ Saturday May 28, 2016. 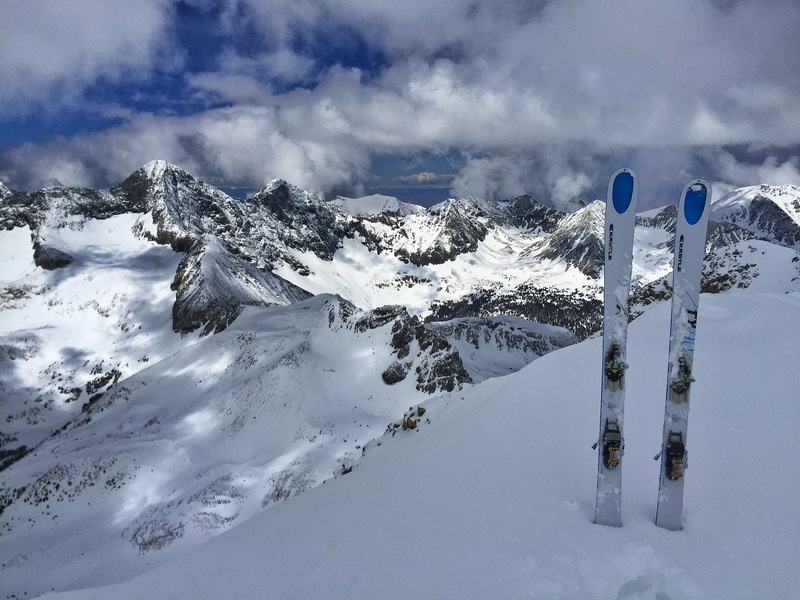 Atop 14,246′ Mount Wilson – the third peak of the day as the weather held just long enough to get the third peak skied and get down safely. #52- Mount Sneffels (14,150′) Tuesday May 31, 2016. #53- Pyramid Peak (14,018′) Wednesday June 1, 2016. (Sat May 21, Sat May 14). 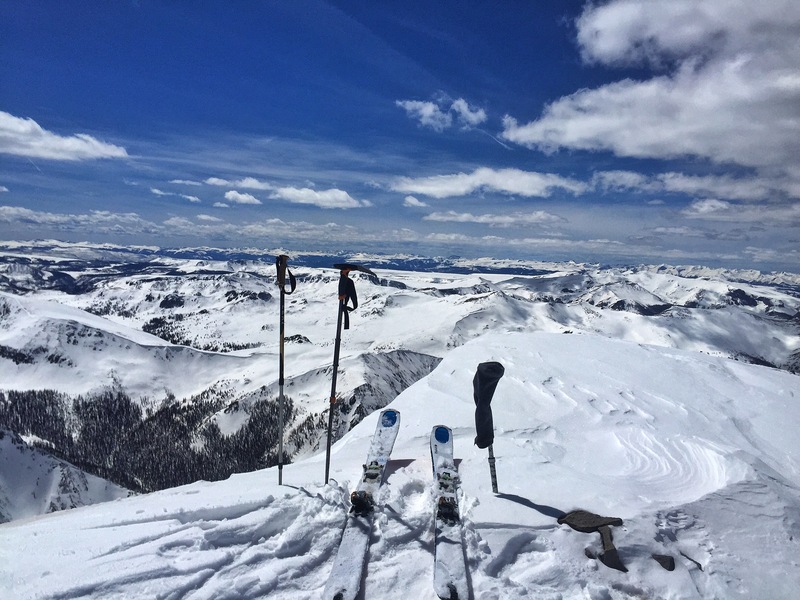 An excellent view from high on Pyramid with Snowmass and Capitol in the distance. #54 Longs Peak 14,256′ Friday June 3, 2016. Heading to Keplingers on Longs. 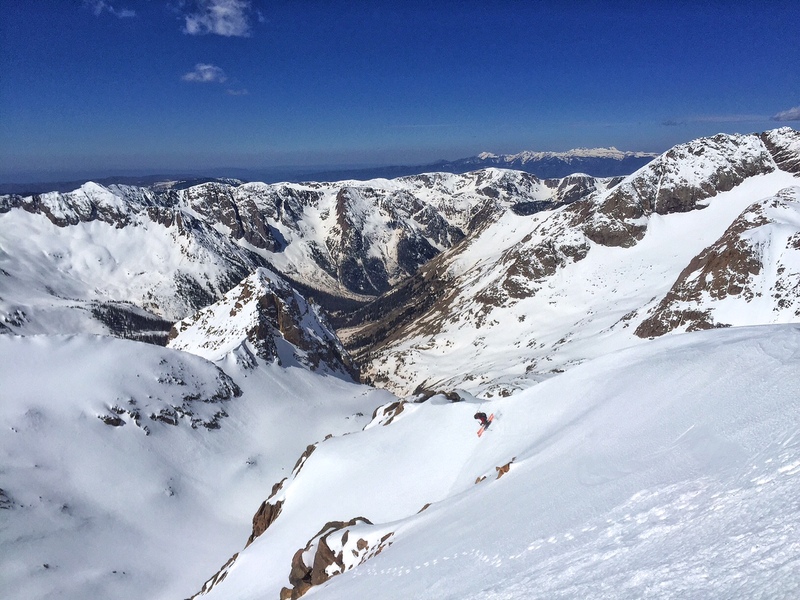 #55 Snowmass 14,092′ Sunday June 5, 2016. 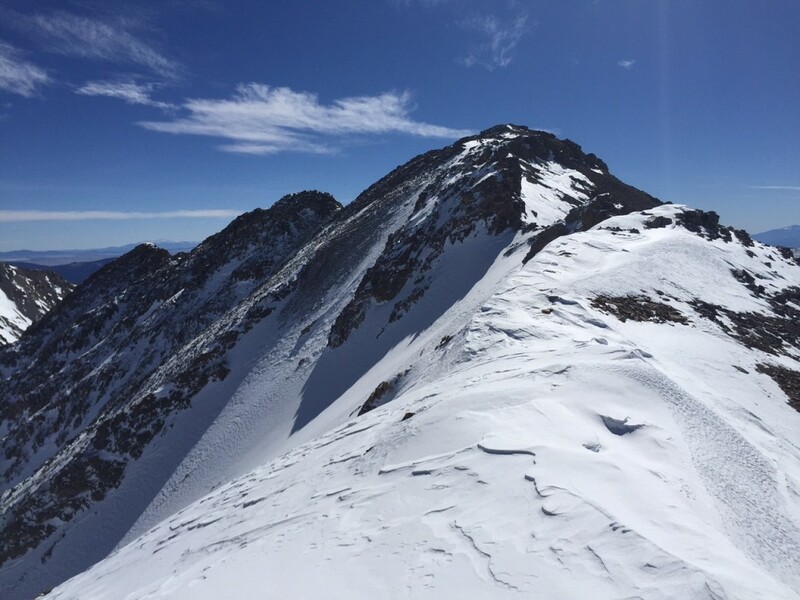 #56 Capitol Peak 14,130′ – June 4, 2015, June 12, 2016.